It is not easy to give the "recipe" of the miraculous substrate giving the insurance of a successful culture of all Mexican Pinguicula. I have tried many different ones from a completely organic to a completely mineral substrate with all the possible intermediates. I think that it is important to have a good knowledge of the biotope of our plants in their natural environment in order to be as close as possible to these conditions in culture, keeping in mind that it is difficult to extrapolate in a pot what happens in nature. For this purpose, examining pictures such as those presented on this web site or elsewhere is certainly a good starting point. In fact I think that there is more than one "miraculous recipe". Some fundamental rules have to be respected that I will now explain with more details. My experience is based on about 15 years of culture in the climatic conditions of the area where I live (see map). These conditions have been tested with most but not all Mexican Pinguicula. I suggest that you look in this web site for the specific pages on each species. As I said previously, each grower has one or more personal recipes depending on his own experience and on the plants he is growing. The components available are numerous and diverse. Most of it have been described in Pierre Gelimaud's article. You can use and mix it in different proportions as you feel it the best for what your plants need in your culture conditions. The fundamental rule is that the substrate shall allow the roots to breath and the water to flow out easily. He needs also to be able to stock enough water during the growing season and to dry during resting season. 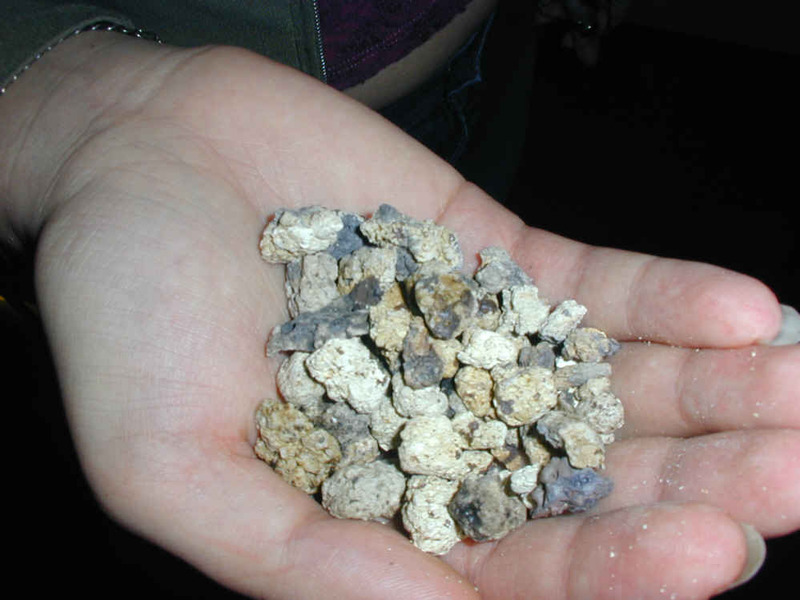 2 perlite, 2 vermiculite, 1 pouzzolane (lava rock), 1 aqualite (can be replaced by one more unit of pouzzolane), 1 fine sand, 1 coarse sand, 1 calcareous clay. All well mixed. It is a well draining medium but the porosity of the materials allows to stock water as well as the evacuation of the surplus of watering. You have certainly noted that this mixing is 100% mineral without organic matter. I am no longer using peat as it is difficult to water it again after drying and finally it provides nothing to the plant. Concerning leaf compost, that it may be tempting to use for the Pinguicula growing in oak forests, it really provides organic components as it is very rich in nutritive elements. It is very difficult to find commercial sources and the only solution is to use self made compost or to collect it in an oak forest. Oak compost is the result of the decomposition after some months of vegetal matter such as for example the autumn falling leaves. What may be dangerous is the fact that , being the result of a decomposition by micro-organisms, it may be a vector for parasites or rot agents. So, only small proportions will be added and it can also be sterilised using a micro-wave Owen. I'll try this at home soon and will tell you the result as soon as possible. It is a point that I think is capital. I use rain water that I have available at home. If the plants are watered too much, they tend to rot. So, I think that it is important to let the substrate drying between two watering. You have to poor enough water to wet the substrate completely. I grow my plants on shelves with trays. I water regularly by the surface of the pot taking care not to wet the rosettes. As soon as the water flows out at the base of the pot I stop watering and go on with the following pot . This watering mode is time consuming but gives you the opportunity to contemplate your plants. In winter, watering is completely stopped. The difficulty is to estimate when it is time to stop watering. In autumn, some Pinguicula have their rosette buried in the substrate and not always visible from the surface. Watering at this stage can induce the rotting of the rosette. It is therefore important and even vital to water the plants only when it is necessary. The majority of Mexican Pinguicula grows in altitude. Night temperatures are low and this induce daily mist and fog on the mountains. Moreover, the humidity evaporated at the surface of the earth during the hot hours of the day condense at night and atmospheric humidity is thus very high. For these reasons, a high atmospheric humidity have to be provided for the culture of Pinguicula but it is important to avoid air stagnation and I use a fan permanently in my greenhouse. In winter, there is still a high atmospheric humidity inside the greenhouse that can be source of rotting the resting rosette and it is important to reduce this air humidity to 50/60%. The plants need a winter dormancy period. This corresponds to the dry season in Mexico. These conditions have to be reproduced in culture by letting the plants dry and in a cold place during winter. Practically, you have to stop watering the plants between September/October and March/April. The exact date depend on the local climate and on your plants. During winter dormancy, temperatures between 5 and 10°C are optimal if the substrate is dry enough. Frost have to be avoided, especially because the air in the greenhouse is saturated with humidity. A small heater is necessary to prevent freezing temperatures and help in drying the media. During growing season, the temperatures will be higher with an optimum of 20 to 25°C. In my greenhouse, the temperatures can reach punctually 35 - 40°C during hot sunny days. Such temperatures are well tolerated by the plants because night temperatures are cooler and this amplitude in temperature seems to be benefic for the plants. I read an article on cactus cultivation where it was indicated that luminosity in Mexico has nothing to do with what we can imagine. Mexico is a very sunny country and, even if the Pinguicula grow under the shade of grass or shrubs, they received more light than in France with direct sun, with some measure of course. Nevertheless, I do not advise to grow your plants in full sun but under a light shading cloth or under "dirty" glass. I have adopted the last solution, it's quite easy and not too much tiring…You just have not to clean the glasses too often. Two kinds of pots can be used : clay pottery or plastic. I use plastic pots for the following reasons : In plastic pots, the humidity of the substrate is better maintained contrarily to porous clay pottery where the substrate dry more rapidly. They are not expensive and light which is a good thing for the tablets of the greenhouse. Many dimensions are available but the difficulty is to choose a size that is good for the winter rosette but also for the summer rosette that is sometimes four times larger . I use generally two sizes of pots, one small (12.5 cm wide, 12 cm high) for medium solitary plants and one big (20 cm wide, 12 cm high) for bigger ones or small colony forming plants. Concerning the colour, it's a question of feeling. White is certainly the best but it's difficult to find. Black should be avoided as it's acting as a heat pump. This may be interesting in winter but in summer it is dangerous as the temperature in the pot can be up to 5°C higher than in the greenhouses this gives 45°C if the maximum temperature is 40°C in the greenhouse ! The roots do not appreciate an overheated and humid environment. Thus I have opted for pots colour "terra-cotta" which are easy to find and represent a good option.